Can Babywearing Stop Your Diastasis From Healing? 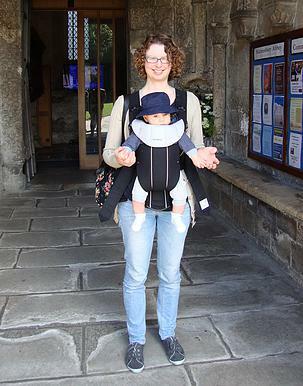 I managed a stretchy wrap with my second when he was teeny, then moved on to a soft structured carrier (SSC) for back carries as soon as I could (4 months). I got to keep him close, while staying hands free to play with big brother (and do household chores and stuff. But I won’t pretend any of that got done very often). Back carry with the Boba! And after starting out in the dreaded Baby Bjorn (more about why the ‘dreaded’ part later), big brother progressed to a toddler SSC too. Look at the sleepy dust in action! But what was happening to my diastasis recti while I was strapping baby to my back for hours every day? There are 2 aspects I want to look at here: the core itself, and what the pressure of a strap around the tummy is doing to it; and posture, and how baby wearing can affect that. The reason I’m so keen to do this is that, if done incorrectly, babywearing could hinder the recovery of your core and pelvic floor. However, I don’t believe this needs to be the case, and I have seen advice out there warning mothers to stay away from front carries until diastasis has healed, or questioning if it’s ok after c-section. And I don’t want anyone to be scared off. BECAUSE BABYWEARING IS AMAZING. Did I mention that? So, as you can see, pressure from wrapping too tightly around the tummy is going to put a lot of strain on the diaphragm and the pelvic floor. Plus the first step in post natal recovery is training the breath, and this can interfere with that big time! I wanted baby as high up on my back as I could get him. I was advised to have the strap up on my ribs, but I couldn’t get it to stay there, it would slip down. So I strapped it as high up on my tummy as I could, and it felt like if I didn’t have him strapped tight he would drop down and the strap at the front ride up. So I would pull the strap firm, pulling my tummy in with it. This is over utilising that TVA muscle, and tiring for my low back. After 3 hours of this (he went through stages of having MEGA naps back there!) it would feel pretty achy! It also had the effect of giving me some rib flare (or at least exaggerating some that may have been there as a result of my pregnancy). So should I babywear if I have diastasis recti? I have seen the advice that front loading carriers should not be used until any diastasis is closed, to avoid pressure on the abdomen. This advice was accompanied by a picture of a front facing out Baby Bjorn. Just like this lovely holiday photo of me with baby number 1. Is a forward facing front carry bad for postnatal abdominal seperation? BB carriers don’t get such a deep seat for baby as SSC or wraps (you can see my little one’s legs dangling in this picture, rather than being in a hip healthier ‘froggy’ position), and the facing out position is often not advised anyway. Plus, BB is the worst culprit for pulling the shoulders forward into hyper kyphosis (see below). So with regards to this particular carrier, I agree. But others? Certainly, increased abdominal pressure could worsen diastasis. And because babywering is usually done for a fairly long period of time (up to an hour+, compared to picking up a buggy or a short time carrying baby in your arms) then comparitavely it is likely to put more pressure on your pelvic floor. Making sure you engage your core and floor while you babywear is important, and ideally seeing a Women’s Health Physio will make sure you’re doing this correctly, and assess how much babywearing your pelvic floor can cope with. But you’re going to be carrying baby anyway, and a good fitting wrap or carrier will keep baby snug and closer to your centre of gravity, so easier to carry. And it should also be easier to correct your posture using a carrier, compared to having baby in your arms. In fact, a wrap can make baby feel even lighter, as it spreads the weight. 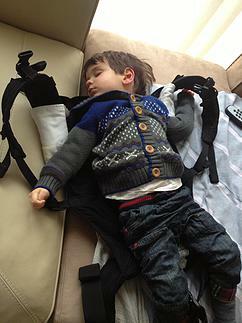 So babywearing won’t necessarily delay healing, or increase abdominal pressure. But you need to consider duration. How long will you babywear for? You may need to start with short periods of babywearing and build up as you get stronger. Again, having your pelvic floor assessed for endurance by a WH Physio is the best way to know what’s suitable. And you need to have the right posture. You could be doing excellent work on rehabilitating your core, but if you stand in poor alignment all day you will be undoing all that work. After having a baby you are left with a weakened core- the transverse abdominis, multifidis, pelvic floor and diaphragm work together to maintain stability as a unit, and your TVA and pelvic floor have just had a hard few months! So many women have postural problems after birth as it is. A poor wrap or fitting carrier will not help this. If you’re not in alignment some muscles may not activate as effectively, while others overwork. 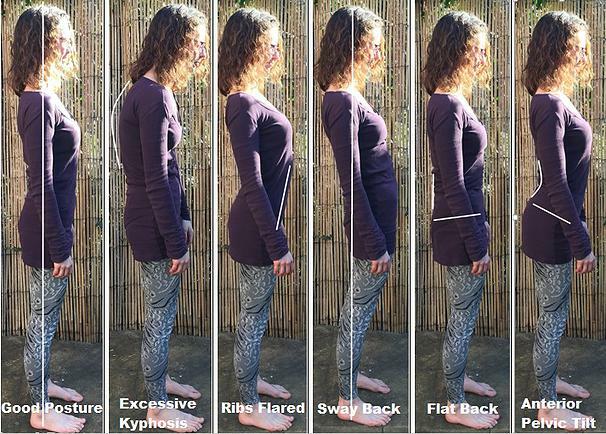 Let’s look at what good posture should look like first. Ribs over hips with a slight arch in the lower back, tall upper spine, and chin tucked in (as opposed to head sticking out like a turtle). Neutral pelvis. If you fully tilt your pelvic forwards (think glamour model back arch), then tuck your bum right under, neutral is roughly in the middle of these two extremes. The two most prominent points on your pelvis should be level with your pubic bone, forming a tripod. Imagine you’re standing with your fly undone. If your bum is tucked under (posterior pelvic tilt) or tilted forward (anterior pelvic tilt) the fly is more likely to gape. Same thing with diastasis, and your pelvic floor will not be in optimum alignment with your diaphragm. Regardless of whether you babywear, if you stand like this all day then DR is less likely to heal. The problem is babywearing can exaggerate these postures. Hyper-kyphosis is the ‘bell rung down’ position Julie Weibe talks about in the video above. It looks like slouching, and as well as hindering healing, it is a risk factor for pelvic organ prolapse (Altmen et al 2008). Then there’s a sway back, which is quite common when carrying a baby- sticking out the tummy whilst leaning back to support baby up on your chest. The result- weakened core muscles, prevention of abdominal healing, and possibly low back and hip pain. I have seen the advice to avoid post c-section, but again, if you’ve recovered enough to lift your baby, I can’t see why you wouldn’t be able to wear him. My main concern would be pressure on the scar, and a stretchy or ring sling should sit much higher than that. I’ll discuss all the options below, along with guidelines to follow, but see here for one sling consultant’s experiences with various wraps post section. As the name suggests. It’s stretchy! Simply a length of material, but the stretch means you can pre wrap and slip baby in. Weight is distributed all over the shoulders and waist, and the stretch makes it really comfy. A stretchy without the stretch, it takes a bit more getting used to these, but as baby gets heavier he will need more support, so this is the next step. There are multiple multiple ways to wrap with a woven, so there is loads of versatility to find a style comfortable for you, and that spreads the weight in an easy way to maintain good alignment. 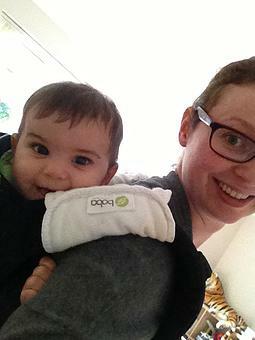 A sling that goes over one shoulder, you can do hip carries with an older baby, or a froggy position with a newborn. The downside is that the pressure is all on one shoulder (although it is spread over the shoulder) so keeping upright can become challenging after a bit. I struggled with more than 20 minutes with mine as it made my shoulder sore, but they were both large by this point and I was unused to the carry. The plus side is they’re quick to use, there’s no pressure on the waist itself, and newborns are light. A panel, with a buckle at the waist and for the arm straps. Easy to use, and they come with different degrees of padding, so find the one you find comfiest and fits your shape best, so as to distribute weight as evenly as possible. Like a SSC but instead of buckles you tie the straps. Follow the TICKS guidelines. Having baby close enough to kiss in particular will help with posture. BUY ALL THE WRAPS! Well, maybe not all, but owning a selection of carriers means you can vary the pressure on your body, kind of the same way it’s good to wear a variety of shoes for your foot health. Take a break. If you do find yourself struggling with posture, or with a large DR, if possible try not to wear for long periods at a time, to give your body a rest. Also, getting dad to wear when he’s there gives you a break. And who doesn’t love a babywearing daddy? And remember, if you get good posture to start, you’ll get stronger and it will get easier to maintain with time. Babywearing can feel like a lifesaver if you have a clingy baby, and I wouldn’t want any mum to feel that she couldn’t do it. Plus, I see plenty of mums pushing buggies in poor alignment too. Get it right and it’s a wonderful way to carry your baby, bond with your baby, and help build your own strength. If you’re unsure about your alignment and how’s it’s affecting your recovery, it’s a big component of my Restore My Core programme. Click here to learn more and grab a spot on the next course. https://www.vanessabarker.com/wp-content/uploads/2015/11/e56a76_03a0787f57dc4614b55e853bfe36faee.jpg 340 255 Vanessa https://www.vanessabarker.com/wp-content/uploads/2015/11/logo.00.jpg Vanessa2015-11-14 14:53:592018-04-24 16:18:15Can Babywearing Stop Your Diastasis From Healing?